A picture is worth a thousand words, and when you add motion to that picture? Well, you’ve just drastically ramped up the wow factor and are much more likely to grab the attention of your customers. Video and motion graphics are a great way to engage more people online but what about offline out in the real world? 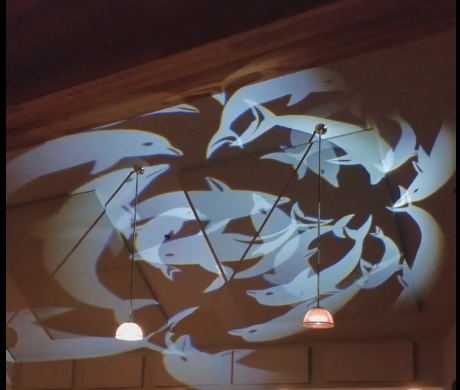 When you need to attract attention or create a compelling environment in-person, mastering how to add motion to gobo projections can create memorable experiences that drive your customers to take action. If you want to change between gobos, do you need a gobo changer or a gobo rotator? A gobo changer is used for switching between different gobos automatically on a timer, a controller or by manually switching between them with a remote. (This is useful when the projector is mounted on a ceiling or in another inaccessible mounting location.) You can use gobo changers to switch between images and/or colors. For instance, a retail store could rotate between four images of different sale items or a charity organization might project the logos of their top four sponsors at their annual benefit. Gobo changers also add eye-catching visuals to trade show booths or create an engaging backdrop for the stage at a conference. For a trade show exhibit, try alternating between your company logo in four different colors You can also create a bold backdrop with a rotating color wash that features your brand palette. At your next conference, try projecting a series of motivational quotes across the stage between speakers. For an easy yet eye-catching effect, use color filters and project washes of color across an interior surface or across an exterior architectural feature like a fountain or central plaza. Our gobo changers are integrated into specific projectors rather than sold as a separate accessory. Look for ECO Spot projectors with the letter ‘C’ next to the name. 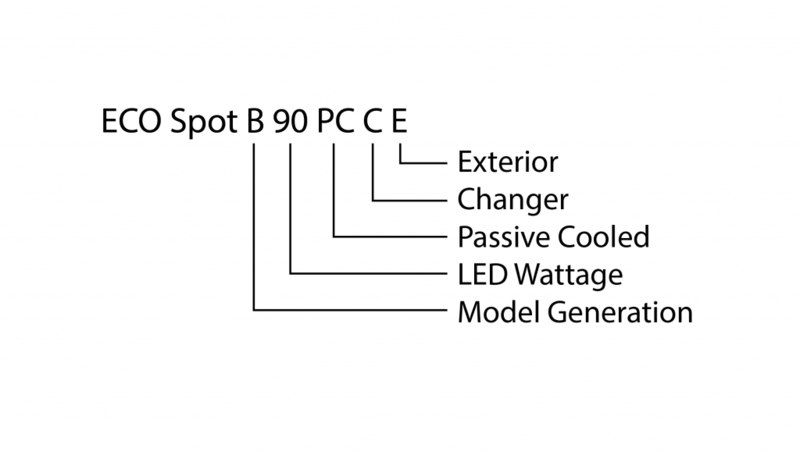 For example, the ECO Spot B90C comes with an integrated 4-slot gobo changer. You can select to rotate through just two or three gobos or you can choose to project only one image. The above video shows the combination of a rotating gobo with a faceted prism placed in front of the projection lens. A gobo rotator rotates a single gobo image around its center in a circle for an eye-catching effect. This motion effect works best for abstract patterns that don’t lose their meaning when turned upside down or sideways. For a logo or other representational art, rotate the gobo slowly so viewers can still easily read the text or make out the image. Besides adding motion to gobo projections, a gobo rotator provides a handy shortcut. Need to adjust the alignment of your gobo image? The rotator lets you quickly align the gobo without even opening the projector. Because this motion accessory is so useful, most ECO Spot projectors come with an integrated, complimentary gobo rotator. We recommend the ECO Spot C25 LED Gobo Projector with Gobo Rotator. Now that you know the difference between a gobo changer and gobo rotator, let’s dive into a few other ways to add motion to gobo projections. Select GoboSource projectors now include blink/fade/dim controls + DMX capability. These projectors (identified in the projector name), feature the ability to add motion to your projections through blinking, fading, and dimming. The advanced settings allow you to choose a slow blink or a fast pulse. (These settings are great for retail stores or safety signage that otherwise might be overlooked.) Other settings include a slow or fast fade and a dimming range. These projectors are indicated with a ‘+’ in the name, such as the ECO Spot C25+. 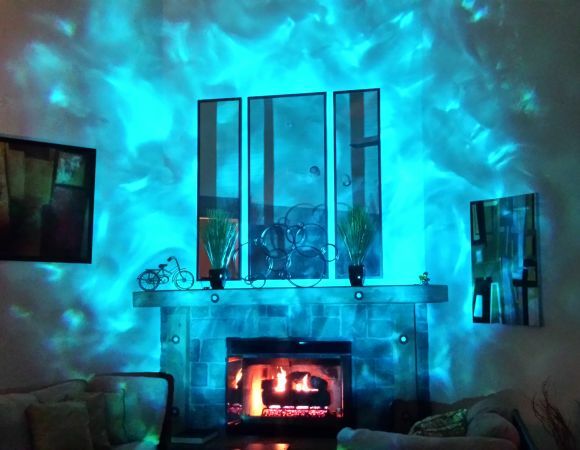 A prism effect can add depth and movement to an otherwise two-dimensional image, bringing your projection to life. A pod of dolphins appeared to swim across the gym at a Scotts Valley Middle School dance, delighting students and parents and effortlessly transforming the gym into an underwater scene. To create your own prism effect, pair the ECO Spot Prism 3D Lens with one of our prism-compatible gobos. (Our two favorites are the Dolphins or Koi Fish gobo.) We can also design a custom version for you. Combine a prism effect with a gobo rotator for a 3D, animated effect. You can generate a simpler prism effect by placing an ECO Spot 3-Way Prism onto the lens of your ECO Spot 10, 25, 40, or 60 Projector. In combination with the rotator, the Prism Lens Adapter allows you to project three overlapping images. These images continually rotate for a memorable 3D, animated effect. Turn a walkway into a flowing stream or warm up a cold room with flickering flames using the interior or exterior ECO Spot LED40-LE Liquid Effect Projector. This projector includes an integrated color wheel that slowly changes between red, blue, yellow, and white. You also have the option to project a single color such as Mediterranean blue for a tropical ocean feel or Flame red for a crackling fire. 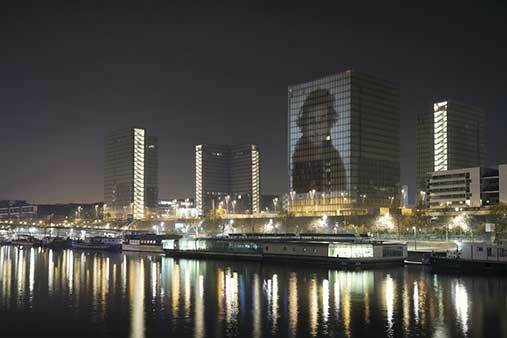 Large-scale architectural lighting effects, such as covering a multi-story building with an image or color wash, is most effective with the GOLUX projectors. This line of projectors has its own set of gobo motion effect accessories, including a gobo changer and water effect wheel. GOLUX projectors ensure that your images retain their clarity and project in bold, crisp colors across large surfaces. You can add movement to your projections with a gobo changer and one of several stock or custom effect wheel patterns. Example 1: The ECO Spot LED B90CE is a 2nd generation (B) exterior (E) projector with an integrated gobo changer (C) and 90-Watt LED lamp. Example 2: The ECO Spot LED B300PCE for Rugged Environments is a 2nd generation (B) exterior (E) projector with passive cooling(PC), and 300-Watt LED lamp. Posted on March 28, 2018 by gobosour. This entry was posted in Events, Marketing and tagged custom gobo, custom gobos, ECO Spot projectors, event decorating, event promotion, full-color gobos, gobo, gobo motion effects, gobo patterns, gobo projector, lighting effects, marketing tools. Bookmark the permalink.